The inscription on John Thomson’s gravestone. Whilst a sunny May 25th 1967 in Lisbon is a date and place that will never be forgotten by Celtic fans, another date, further back in time will also live perpetually in the hearts and minds of followers of the Glasgow giants. On September 5th 1931, Celtic took on perennial rivals Rangers and, as ever, the game was fiercely fought. 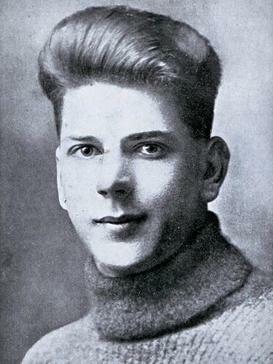 However, an incident that occured when John Thomson, the hoops goalkeeper dived at the feet of Rangers forward Sam English cannot be put down to the heat of the battle or the undeniable and often bitter rivalry between the teams. It was purely an accidental clash between two committed players and none who witnessed it could have a real idea how serious it was. The fact that Thomson, already revered by the Celtic faithful, was stretchered off was unusual in a time when players rarely left the pitch other than for a serious injury as no replacements were allowed. But few could have realised that it wouldn’t just be the end of the match for the goalkeeper but would also bring a tragic end to his life at a mere 22 years of age. 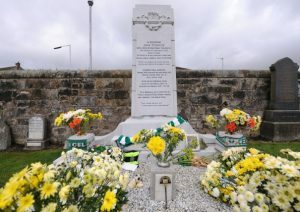 Five hours after the incident, Thomson passed away in Glasgow’s Victoria Infirmary and the whole of football joined Celtic in mourning. John Thomson was born in Kirkcaldy, Fife, on the 28th of January 1909. He grew up in the mining community of Cardenden, also in Fife and started working at the Bowhill Colliery, where his father also worked, when he was 14. In 1924. Having won trophies whilst at high school, Thomson joined local team Bowhill Rovers. The next season he moved to Wellesley Juniors and it was here that he came to the attention of Celtic. In 1926, having heard good reports about the Denbeith Star goalkeeper, Celtic boss Willie Maley sent his chief scout to watch them play Wellesley Juniors. The scout returned with a rave report, not of the Denbeith ‘keeper but of Thomson. Maley had every reason to trust in the short opinion of the scout in question; Steve Callaghan had already alerted the club to the ability of Jimmy McGrory who had by then established himself as a star of the side and who went on to score 395 goals in 378 appearances. So Maley signed the 17-year-old for the princely sum of £10. Within four months, the Celtic boss, having despaired of the inconsistent form of first-choice Peter Shevlin, decided to give Thomson his chance. The youngster grabbed it, making his debut in a 2-1 win at Dundee, and kept his place in the side from then on. 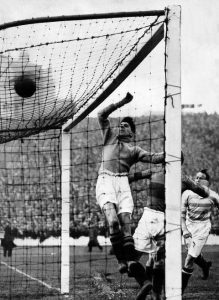 At 5ft 9, the lightly-framed Thomson did not seem ideally suited for the goalkeeping position, especially given that ‘keepers were given much less protection by referees in those days. But his agility and ability to read the game, along with his bravery, more than compensated for the lack of physical presence. In truth, this wasn’t a golden era in Celtic’s fabled history. 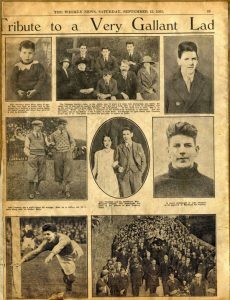 Despite the presence of Thomson and McGrory, rivals Rangers were the dominant force in Scottish football in the 1920s. There was speculation at one time that both stars might be sold to fund the construction of a new stand, but the two players made it clear that they wanted to stay at the club, a commitment that further endeared them to fans. In February 1930 in a game against Airdrie, he suffered a broken jaw, fractured ribs and the loss of two teeth. But he returned undaunted soon after and appeared in his first international for his country three months after. On 5 September 1931, 80,000 crammed into Ibrox. Early in the second half, with the game scoreless, Thomson and Rangers forward Sam English went for a ball at the same time. The goalkeeper’s head made contact with the knee of English. Thomson was attended to by men from the St Andrew’s Ambulance Association and he was eventually stretchered off the pitch. Most in the crowd would have assumed that he had been concussed, but those closer knew that something more serious had occurred. Indeed, one Rangers player, a medical student, said later that as soon as he’d seen him he gave the Celtic man little chance of survival. According to The Scotsman newspaper, Thomson was seen to rise as he was being stretchered off and look towards the place where the incident had happened. Thomson was taken immediately to the Victoria Infirmary in Glasgow where, at 5pm, he suffered what was termed ‘a major convulsion’. Surgery was carried out to reduce pressure on the brain but this proved unsuccessful and Thomson passed away later that evening. The funeral took place in Cardenden on 9 September 1931. A reported 20,000 people turned out in Glasgow to see off two trains, carrying another 2,000 mourners and laden with flowers, as they left for Cardenden. Many walked the 55 miles to Cardenden where there were a reported 40,000 in attendance. In Glasgow there was a memorial service in Trinity Church. English attended and was reported to be seen weeping during the playing of music. The Rev H. S. McLelland after reading one of the lessons said that he had attended the match and commented; “What we saw then was an act of superb and uncalculating courage, an act of supreme and unfaltering loyalty, a flash of that divine fire that burns out all thought of self when danger assails that to which we are committed. “John Thomson did not give his life for a goal. He gave his life for an ideal – the ideal for which every brace life ought to be willing to lay itself down – loyalty to the trust placed in our hands. Sam English played on after the accident, moving south to join Liverpool for a while. Upon hanging up his boots in 1938 at the age of just 30 he reportedly told a friend that he’d had ‘seven years of joyless sport’ after the tragic accident. In Cardenden, the funeral service was carried out in the garden of the Thomson home conducted by a friend and former-mining colleague John Howie an elder of the Church of Christ of which the Thomson family were members. Then, Celtic players carried the coffin the half mile to Bowhill Cemetery. An internment service was carried out at the graveside but few of the thousands in attendance were able to witness in the small cemetery. After Thomson had been laid to rest many hundreds walked past the open grave and paid their own tribute. All accounts from the time speak of John Thomson as a quietly-spoken, yet friendly young man. Recently engaged to be married and with a great future surely in front of him, his life was cruelly snatched away in a tragic accident while playing the sport he loved for the team and teammates he revered, and was revered by.